Objective To investigate the theory of premorbid fitness in amyotrophic lateral sclerosis (ALS), we studied whether a common genetic profile for physical or cardiovascular fitness was manifest in progenitors leading to less cardiovascular death and a longer lifespan in parents of patients with ALS compared with parents of controls. Methods Patient and disease characteristics, levels of physical activity, parental cause and age of death were obtained using a structured questionnaire from a population-based, case–control study of ALS in the Netherlands. Logistic regression was used for the analyses of parental cause of death and levels of physical activity. Cox proportional hazard models were applied to study the association between parental survival and ALS, or specific patient subgroups. All models were adjusted for age at inclusion, level of education, body mass index, diabetes, hypercholesterolaemia and hypertension. Results 487 patients and 1092 controls were included. Parents of patients died less frequently from a cardiovascular disease compared with parents of controls (OR=0.78, p=0.009). Their survival, however, was neither significantly longer nor shorter. Neither rates of cardiovascular causes of death, nor survival of parents was related to the extent to which patients were physically active in leisure time (all p>0.05). 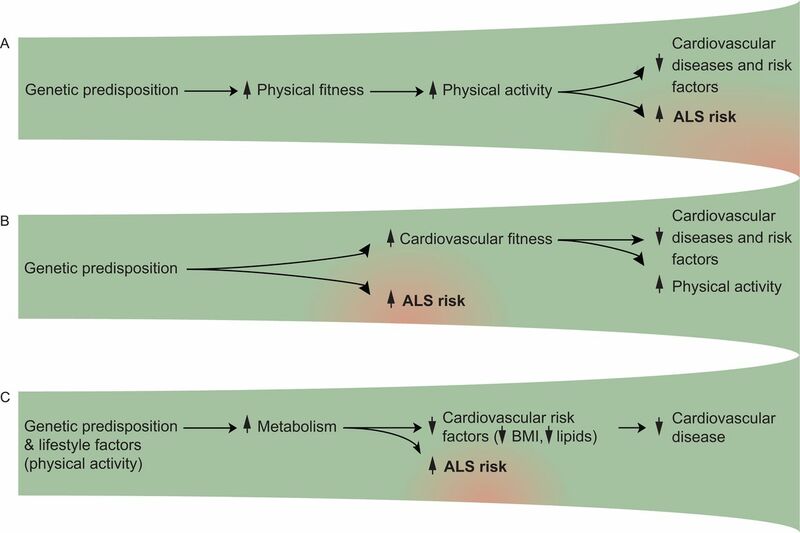 Conclusions Exploring the fitness hypothesis in the pathogenesis of ALS, our findings provide evidence for a shared mechanism underlying a favourable cardiovascular fitness profile and ALS susceptibility. If unambiguous evidence emerges that factors associated with physical or just cardiovascular fitness are important, future focused fundamental research may provide a worthwhile path to unravelling the ALS pathophysiology. We hypothesise that a common genetic profile for these traits will also manifest in progenitors, thus leading to less cardiovascular death and a longer lifespan in parents of patients with ALS compared with parents of controls. In this large population-based, case–control study, we explored parental causes of death and survival in patients with ALS and in matched controls, or in subsets of participants with specific characteristics. We included matched patients and controls who completed the questionnaire between 1 May 2010 and 21 April 2014. Patients were diagnosed with possible, probable—laboratory supported, probable or definite ALS according to the revised El Escorial criteria.9 We excluded subjects if one of their parents died of ALS. All participants gave written informed consent and the study was approved by the medical ethical committee. Using a structured questionnaire, data on demographic information, parental year of birth, parental cause and age of death, body mass index (BMI), (year of) diagnosis of diabetes, hypercholesterolaemia and hypertension were collected for this study from all participants. The questionnaire was designed to collect data on a variety of risk factors; participants were unaware of the hypotheses being tested to reduce recall bias. All questionnaires were checked thoroughly by two persons for missing data or inconsistencies, and participants were approached by telephone to complete or correct the data. After patients had given informed consent, medical records were obtained for clinical information. The survival status of patients was derived from the municipal population register or by contacting the general practitioner on a 3-monthly basis, or both. Data were coded to ensure blinding. Highest level of education was categorised into four groups: (1) No education or elementary school, (2) lower secondary school or technical school, (3) higher secondary school and (4) higher professional education or university. Multivariate logistic regression was used to compare causes of death between parents of patients and parents of controls, and in particular to analyse whether parents of patients were less likely to die of cardiovascular diseases. We chose to adjust all models for age at time of inclusion, educational level, BMI, diabetes, hypercholesterolaemia and hypertension. In the subset analyses of patients with ‘familial ALS’ and ‘C9orf72 repeat expansion’, we restricted the model adjustment to age at time of inclusion and educational level, because of the smaller sample sizes. Age of subjects was included because we assume that older subjects will have parents who were born earlier in the 20th century. As life expectancy changed during the previous century, this might influence both the cause of death and the average lifespan. Moreover, it has been previously hypothesised that the age at onset might be influenced by (prenatal) environmental factors, such as dietary habits or exposure to smoking in utero, which could result in both an increased ALS risk and a reduced parental life expectancy.13 Educational level was included because we feel it serves as a good proxy for socioeconomic status of subjects and their direct environment, assuming this covers confounding factors such as the subjects’ alcohol use, smoking habits and BMI. Educational level is associated with morbidity, mortality and life expectancy in parents.14 15 A diagnosis of diabetes, hypercholesterolaemia and/or hypertension was adjusted to the period before symptom onset for patients and study inclusion for controls. The same model was used to determine the association between leisure time physical activity and cardiovascular death. A multivariate Cox proportional hazard model was used to study the association between parental survival and ALS. This model was also used to determine the association of parental age with patient and disease characteristics, and with levels of physical activity. To relate patient survival to parental age, only deceased patients were included in the model. With regard to disease characteristics and physical activity, survival and MET scores were categorised into quartiles. All survival analyses were stratified for fathers and mothers to include subjects for whom information on only one parent was available. In the stratified analysis, subjects whose parent died following severe trauma were excluded. Censoring age was calculated based on the parental year of birth, using 1 July of the corresponding year. As censoring date we used the date of study inclusion. Again, we adjusted for age at time of inclusion, educational level, BMI, diabetes, hypercholesterolaemia and hypertension in the analyses of patients with ‘sporadic ALS’ and age at time of inclusion and educational level in the survival analyses of the patients with ‘familial ALS’ and ‘C9orf72 repeat expansion’ . The level of significance was set at p<0.05. Data were analysed using IBM SPSS Statistics V.20.0 and graphs were produced using R version 3.1.0. Between 1 May 2010 and 21 April 2014 we included 754 patients with ALS in the PAN, of which 568 patients with ALS returned the questionnaire (response rate 75.3%). Baseline characteristics were comparable between the two groups (online supplementary table S1). After excluding 14 patients whose parent died of ALS, a total of 1579 subjects (487 patients with apparent sporadic ALS and 1092 controls) were found eligible for inclusion. Data were available on both parents of 475 patients. In 12 patients, data were only completed for one parent (1 father and 11 mothers). Data were available on both parents of 1054 controls. In 38 controls, data were only completed for one parent (2 fathers and 36 mothers). Table 1 represents the baseline characteristics for both groups. Cardiovascular disease was significantly less frequently the cause of death in parents of sporadic patients with ALS compared with parents of controls (31.2% vs 35.8%; OR (95% CI) = 0.78 (0.64 to 0.94), p=0.009) (table 2). The survival of parents who died from a cardiovascular disease was similar in patients and controls. The rates of a cardiovascular cause of death, as well as the age at death from a cardiovascular disease, were comparable between parents of patients who were least (lower 25th percentile), and parents of patients who were most (upper 25th percentile) physically active in leisure time (26.3% and 24.6%; 74.0 and 72.5 years; online supplementary table S2). We also found that parents of sporadic patients with ALS (4.0%) more often die from diseases categorised as ‘other’ when compared with parents of controls (2.3%) (OR (95% CI) = 2.09 (1.27 to 3.40), p=0.003), without a difference in survival. This category includes a variety of diseases of the kidneys, liver or lungs. Parents of patients with familial ALS were more likely to die from neurodegenerative diseases (all dementia) than parents of controls (67.6% dementia, 27% Parkinson’s disease, 2.7% multiple sclerosis and 2.7% Huntington’s disease) (OR (95% CI) = 2.77 (1.33 to 5.76), p=0.01), without a difference in the parental age at death. A similar trend was also seen in parents of patients with a C9orf72 repeat expansion (online supplementary table S3). An overview of the number of deceased and censored parents and the age at death or, when alive, age at moment of filling in the questionnaire (censoring age) is provided in table 3. Due to a longer life expectancy in women, more mothers (20.6% of the patients, 25.0% of the controls) than fathers (8.8% of the patients, 9.7% of the controls) were alive at the time the questionnaire was filled in. The median age at death was similar in mothers of patients (82.0 years) and controls (82.0 years), as well as in fathers of patients (74.0 years) and controls (75.0 years). Figure 1 displays the Kaplan-Meier survival curves, showing a similar survival for parents of sporadic patients with ALS and controls. HR, adjusted for age at time of inclusion and education, were 1.04 (95% CI 0.92 to 1.17, p=0.55) for fathers, and 1.03 (95% CI 0.90 to 1.17, p=0.66) for mothers. The same holds for parents of 55 patients with familial ALS (61.8% with a C9orf72 repeat expansion), and parents of 35 patients with a C9orf72 repeat expansion (14.3% having at least one family member with ALS): their survival was similar to the survival of parents of controls. HRs for parents of patients with familial ALS compared with controls were 1.08 (95% CI 0.79 to 1.46, p=0.64) for fathers, and 1.25 (95% CI 0.91 to 1.73, p=0.17) for mothers; for parents of patients with C9orf72 repeat expansion compared with controls were 1.07 (95% CI 0.72 to 1.58, p=0.73) for fathers, and 1.46 (95% CI 0.98 to 2.16, p=0.06) for mothers. Kaplan-Meier parental survival estimates according to disease status. 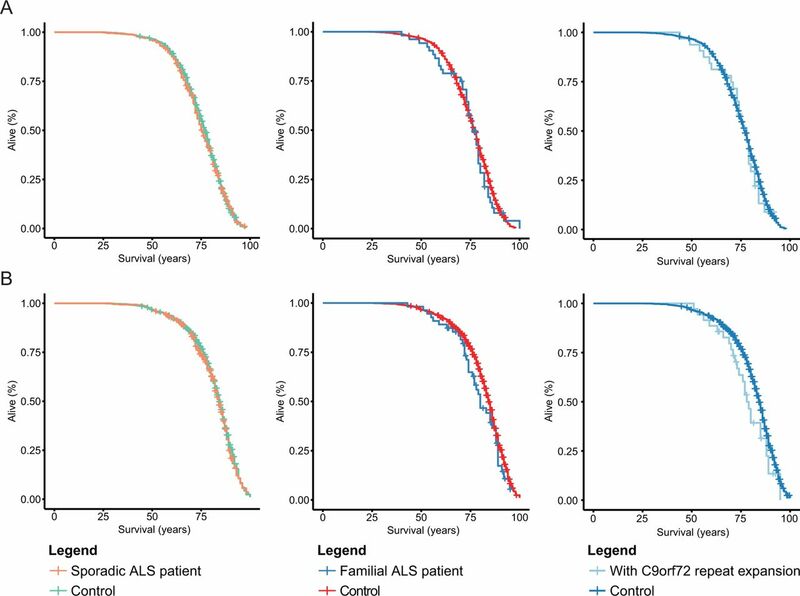 Stratified survival analyses for (A) fathers and (B) mothers of patients with apparent sporadic or familial amyotrophic lateral sclerosis (ALS), or patients with a C9orf72 repeat expansion. Familial ALS is defined as having a first, second or third degree family member with ALS or having a C9orf72 repeat expansion or both. No association was found between site of onset and parental survival (HRfathers=0.89, p=0.29; HRmothers=1.11, p=0.39), nor was there an association between disease duration until death of patients and survival of parents (HRfathers=1.02, p=0.93; HRmothers=1.21, p=0.35). No difference was found in parental survival between patients who were least active and those who were most active in leisure time (HRfathers=1.33, p=0.07; HRmothers=0.97, p=0.84) (online supplementary table S4). Three possible mechanisms describing the relation of a cardiovascular and physical fitness profile to ALS risk are summarised in figure 2. The persistent finding of a favourable cardiovascular profile in patients with ALS could be the result of a genetic predisposition for increased physical fitness leading to more physical activity, which may increase the risk of ALS and decrease the risk of cardiovascular disease (figure 2A). As outlined above, this hypothesis could not be supported by our data. Alternatively, patients may have a genetic predisposition for being cardiovascularly fit as well as an increased risk of ALS; a better cardiovascular profile reduces the rate of cardiovascular diseases and may increase physical activity, and in parallel, individuals may develop ALS (figure 2B). A direct causal link between a beneficial cardiovascular profile and developing ALS is difficult to imagine. So, in addition to the hypothesis described in figure 2B, we propose another hypothesis that incorporates an independent role for cardiovascular fitness and ALS risk (figure 2C): a genetic predisposition, possibly in combination with exogenous risk factors (such as physical activity), could induce (or reduce) activation of a specific (disease) pathway, for example metabolism, leading to an increased risk of ALS and a beneficial cardiovascular risk profile. A role for hypermetabolism in developing ALS has been reported previously in a number of human and animal studies, in sporadic and in familial disease.28–33 It may be worth noting that the prevalence rates of a cardiovascular cause of death are comparable between parents of patients with sporadic ALS, parents of patients with familial ALS and parents of patients with a C9orf72 repeat expansion (online supplementary table S3), suggesting similar pathways. A combined analysis of genetic studies on physical fitness and ALS might help to further elucidate this fitness hypothesis. Our proposed concept shift in the pathogenic mechanisms of amyotrophic lateral sclerosis (ALS). From (A) a genetically determined fitness profile, by means of increased physical activity, increases the risk of ALS and decreases the risk of cardiovascular diseases and risk factors; via (B) where both increased ALS risk and cardiovascular fitness are the result of a common genetic predisposition; towards (C) where an increased ALS risk, and fewer cardiovascular risk factors are the result of a specific pathway, modified by genetic predisposition, possibly in combination with exogenous risk factors (such as physical activity). We had the advantage of studying a population-based cohort with information on several confounders, such as educational level, cardiovascular risk factors, lifetime physical activities and C9orf72 genotype. Moreover, in 96.8% of the subjects, information on both parents was available. The fact that there were subjects with one living and one deceased parent at the time of study participation prevented us from combining both parents into a single survival analysis; this would have increased statistical power. However, not even a trend towards longer life expectancy is noticeable when looking at the median ages of fathers and mothers in all stratified analyses. Using questionnaire data, we were dependent on the information provided by the participants; we were unable to check the parental cause of death by death certificates in case this was missing. However, both patients and controls were contacted when data was incomplete or incorrect and the percentages of parents with an ‘unknown’ cause of death were similar in patients and controls. Since we did not have data on the leisure time activities for parents, we were limited to the use of physical activity levels of the participants, as opposed to their parents. Socioeconomic status could have been an important modifier of the association between parental causes of death or survival and ALS. Using highest educational level as indicator for socioeconomic status, we entered an interaction term between cardiovascular cause of death and educational level, or disease status and educational level in the survival analysis. In these models, no significant interaction was found. Thus, in both high and low educated patients, parents were less likely to die of a cardiovascular disease. In summary, exploring the fitness hypothesis in the pathogenesis of ALS, our findings provide evidence for a shared mechanism underlying a favourable cardiovascular fitness profile and ALS susceptibility. We thank Hermieneke Vergunst (University Medical Centre Utrecht) for technical assistance. We also thank the other staff members of the Dutch ALS Centre for the considerable effort they put into the organisation of the PAN study. We thank all neurologists, consultants in rehabilitation medicine and other healthcare providers for enrolling patients with ALS. Finally, we are grateful to all patients with ALS and controls for giving their valuable time to participate in this study.
. World federation of neurology research group on motor neuron diseases. el escorial revisited: revised criteria for the diagnosis of amyotrophic lateral sclerosis. Amyotroph Lateral Scler Other Motor Neuron Disord 2000;1:293–9. Centers for disease control and prevention. Falls among older adults. http://www.cdc.gov/homeandrecreationalsafety/falls/adultfalls.html (accessed Sep 6 2016). Funding This work was supported by the Netherlands ALS Foundation. LHvdB received a grant from the Netherlands Organisation for Health Research and Development (Vici scheme). Competing interests AEV: Drafting the manuscript for content, including medical writing for content; study concept or design; analysis or interpretation of data; acquisition of data; statistical analysis. MS, AFCH, JAdG, AJvdK, JR, JHV: Revising the manuscript for content, including medical writing for content; study concept or design; acquisition of data. LHvdB: Revising the manuscript for content, including medical writing for content; study concept or design; analysis or interpretation of data; study supervision or coordination; obtaining funding. Is cardiovascular fitness a risk factor for ALS?